Sitting in the heart of Khao Sok National Park, magnificent Cheow Larn Lake is one of the most beautiful locations in Thailand. 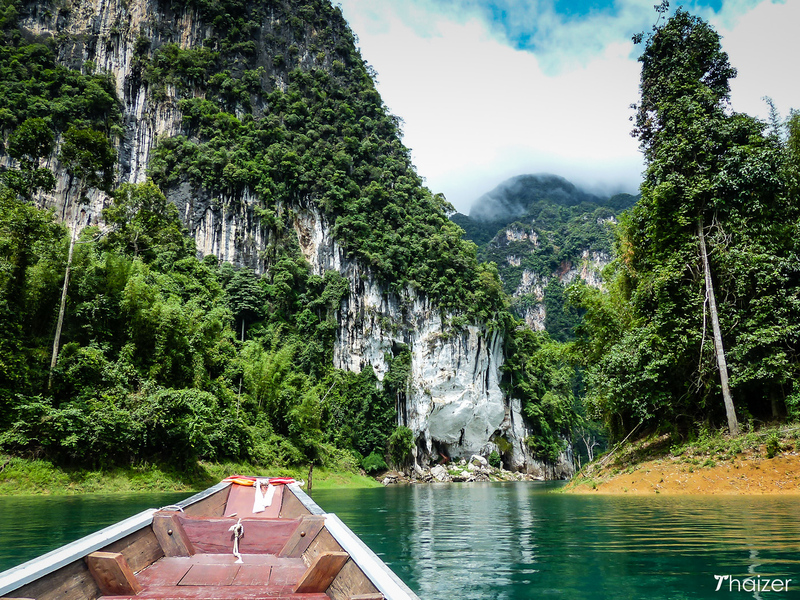 Ringed by jungle-clad mountains and with vertiginous limestone karsts and submerged trees breaking the surface of the water, it’s a spectacular place to visit. Almost amazing as the scenery is the fact that this massive lake in southern Thailand didn’t exist prior to the 1980s. Cheow Larn Lake was created following the construction of Ratchaprapa Dam in 1982. 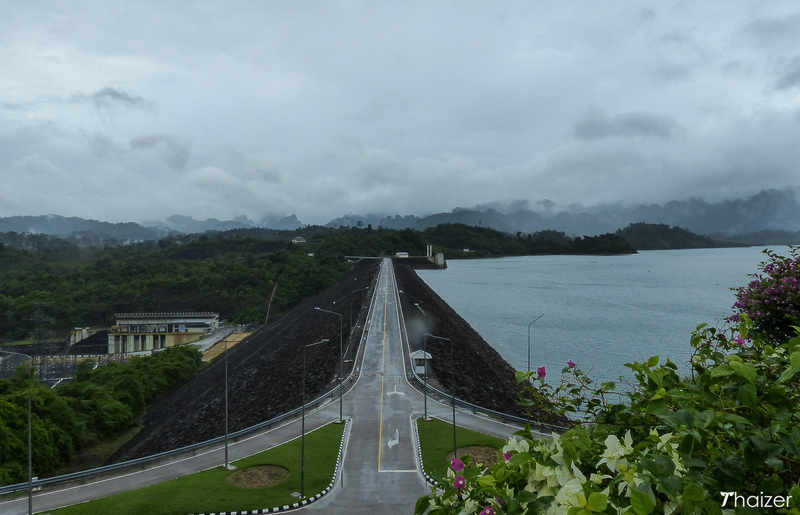 The hydroelectric dam was built to provide electricity for Surat Thani and other parts of southern Thailand. As part of the wider Cheow Larn project, the dam and reservoir were constructed for flood control, irrigation and fishing. With the lake around 30 kilometres long and the basin area covering 165 square kilometres, it took almost a year to flood the valley and the rainforest which occupied the land here. Some villagers had to be resettled and in addition to receiving financial compensation and land, alternative farming programs were set up to enable them to maintain their livelihoods. Ratchaprapa Dam was formally opened by the King of Thailand in 1987. The Cheow Larn Lake area is home to a diverse range of wildlife and plant life which thrives amidst the islands, submerged trees, caves, mountains and dense jungle. With much of the land around the lake inaccessible and designated as wildlife sanctuaries, the protected habitat supports many species of birds and fish as well larger animals including elephants and wild cats. The Cheow Larn Lake area is also home to a vast array of plants including the famous Rafflesia, one of the largest flowers in the world. There are over a dozen different floating bungalow operations dotted around Cheow Larn Lake. 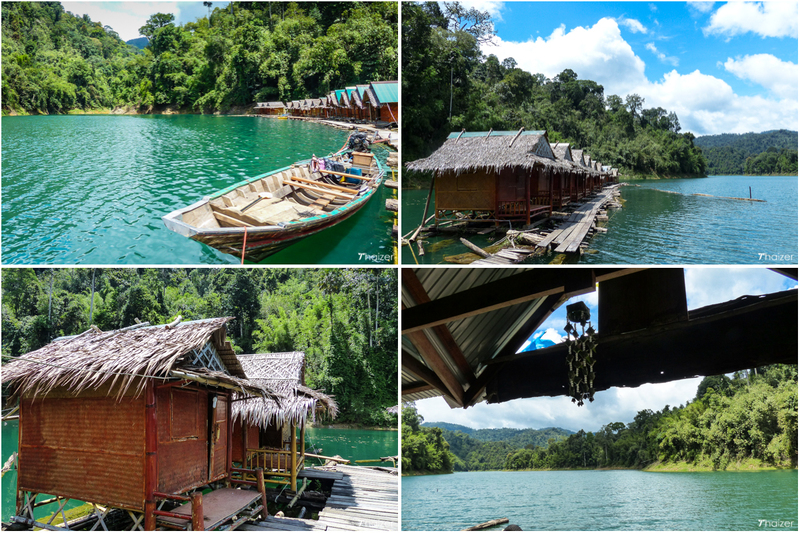 According to the policies of Khao Sok National Park, licenses to own and operate these bungalows are regulated. Licenses are only issued to descendants of the original families from Cheow Larn village or National Park officials. The floating bungalows vary in price and levels of comfort, but all provide a unique opportunity to sleep in the quiet wilderness and wake up to gorgeous views. Kayaks can be rented from most bungalows for self-exploration of the waterways. 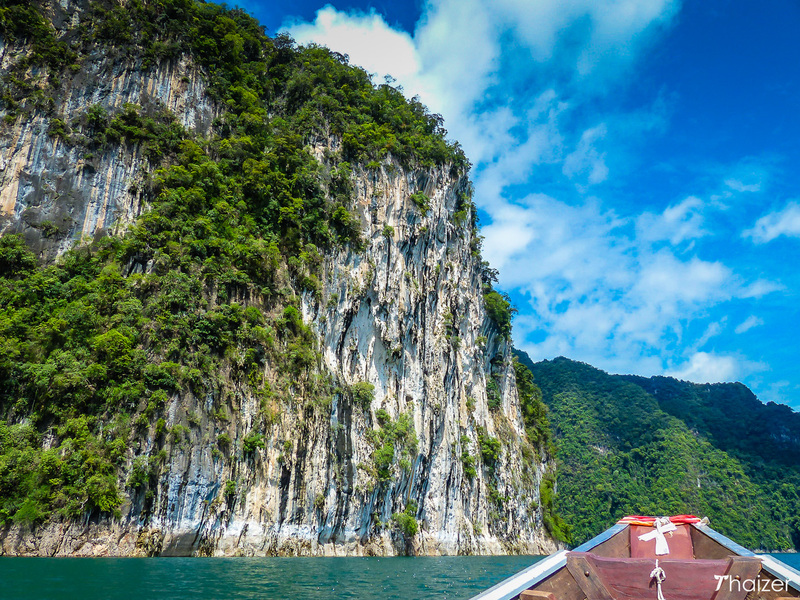 Bookings for the floating bungalows can be made via tour offices once you arrive in Khao Sok. 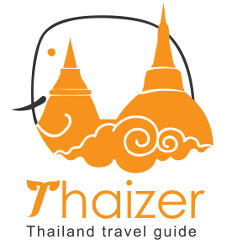 The access point to the lake and dam is in the Ban Ta Khun district of Surat Thani province. If travelling independently, Ratchaprapa Dam is clearly signposted in Thai and English when you reach the town of Ban Ta Khun on route 401. From there follow the signs to the dam which is approximately 15 km away. You’ll pass through a checkpoint as you approach the dam and you’ll also need to pay the National Park fee (300 Baht for adults, 150 Baht for children) at a separate booth before you can go on any of the longtail boats on the lake. Most tourists to Ratchaprapa Dam and Cheow Larn Lake visit on one-day tours although it is possible to stay overnight at the floating bungalows mentioned above. 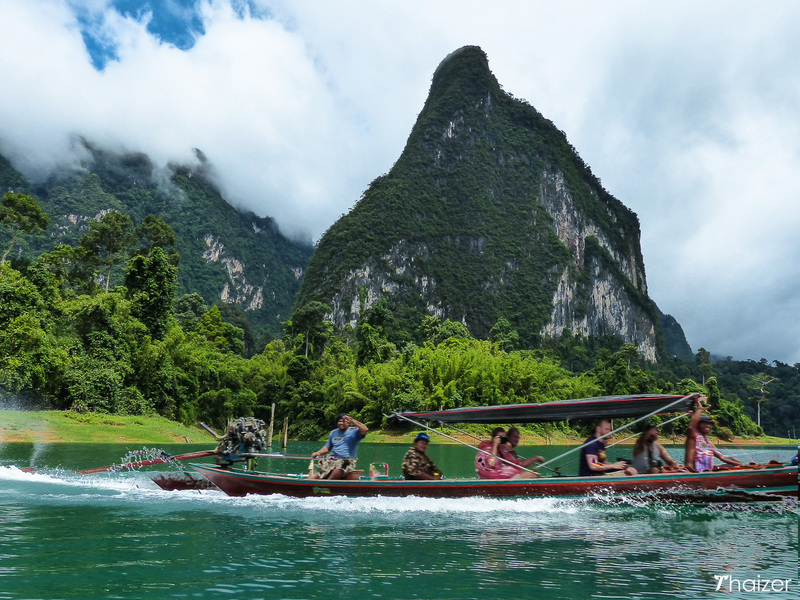 There are few other accommodation options close to the lake and many tourists visiting Khao Sok choose to base themselves closer to the Khao Sok National Park headquarters and visitors centre which is approximately 50 km away to the west. 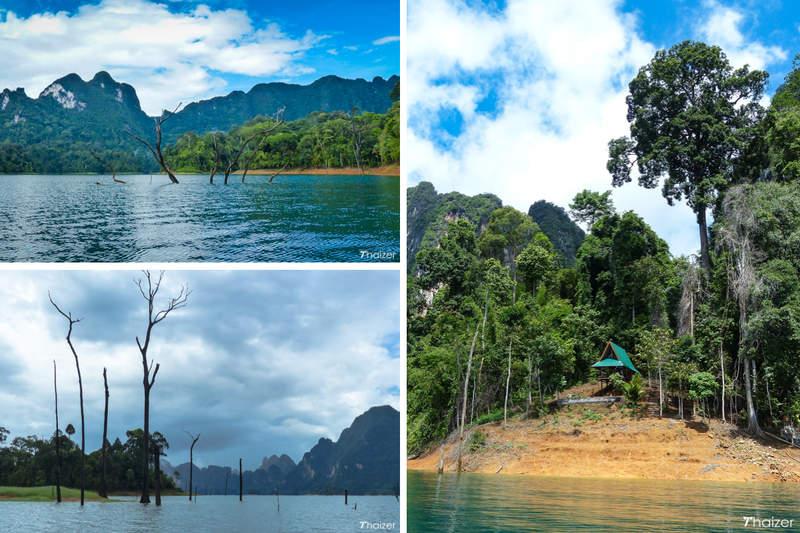 Any guest-house and tour office in Khao Sok can arrange a day trip to Cheow Larn Lake for you. Prices will vary depending on the length of the trip and in most cases they exclude the National Park entrance fee which you pay yourself on arrival. As an estimate, expect to pay at least 1,500 Baht for a day trip arranged from tour offices or resorts in the Khao Sok area. My recent visit to Ratchaprapa Dam and Cheow Larn Lake was arranged by Anurak Community Lodge in Khao Sok. 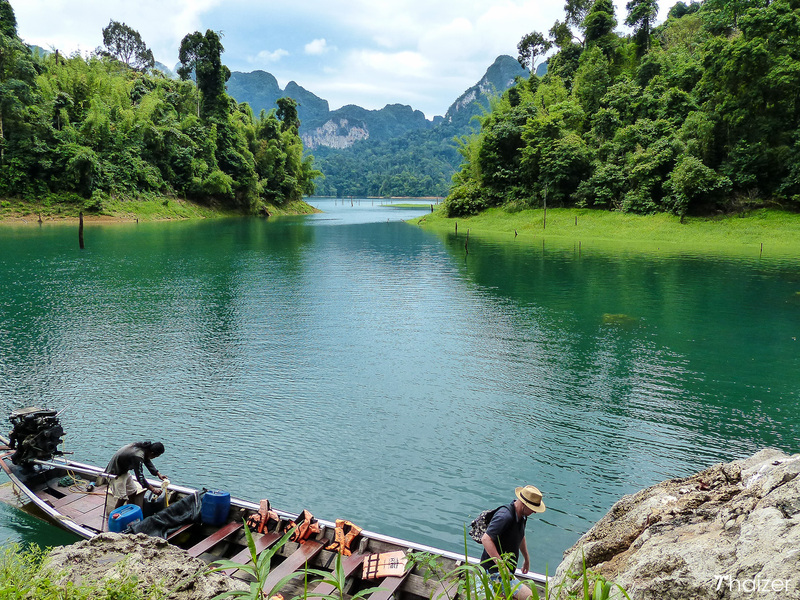 A typical day trip will see you depart Khao Sok National Park at 9am. 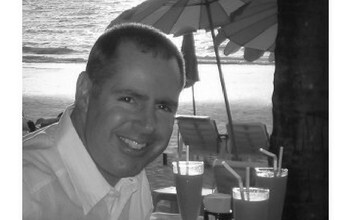 From there you’ll drive by mini-van to the town of Ban Ta Khun and have a brief stop to visit the market and buy any wet weather gear or shoes. 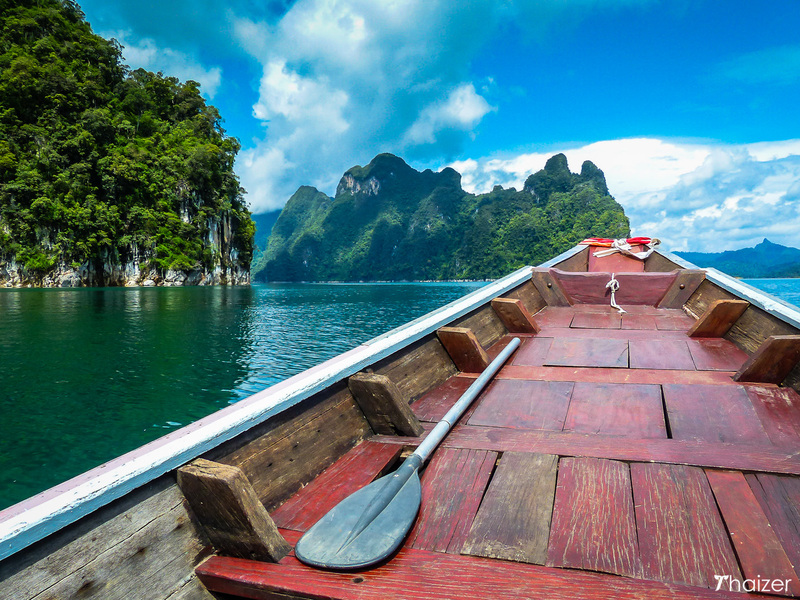 Whatever time of the year you are visiting Khao Sok, the weather can change quickly. It can be raining heavily on one part of Cheow Larn Lake with clear blue skies a few kilometres away. It’s recommended to take sunglasses, sun-hat, a rain jacket or poncho and a waterproof bag for your camera or phone. On arrival at the lake, you’ll be taken on a longtail boat for a cruise of an hour or so before stopping at one of the floating bungalows where you’ll have the opportunity to swim in the lake before lunch. The cruise will then resume and depending on the season or weather you may go for a hike or visit a cave. Make sure you wear footwear with decent grip. If visiting caves you’ll be given flash-lights to strap to your head, but no helmets. Please be very careful. Floors are slippery and conditions can be dangerous. On my recent visit to Pra Kay Petch Cave, three out of the ten people from my boat banged their heads in the cave including one man who slipped and fell on his backside. I asked the guide why they didn’t provide helmets to which he replied ‘don’t worry’. He then proceeded to proudly tell me that nobody was badly injured unlike his recent trip where one tourist had to be taken to hospital after cutting his head open! Other caves may be less dangerous and other guides more responsible, but given the choice again I would decide to wait outside. Boats return to the pier late afternoon where your mini-van will then normally make the short drive to Ratchaprapa Dam and the viewpoint for a brief stop for photos before taking you back to your accommodation. 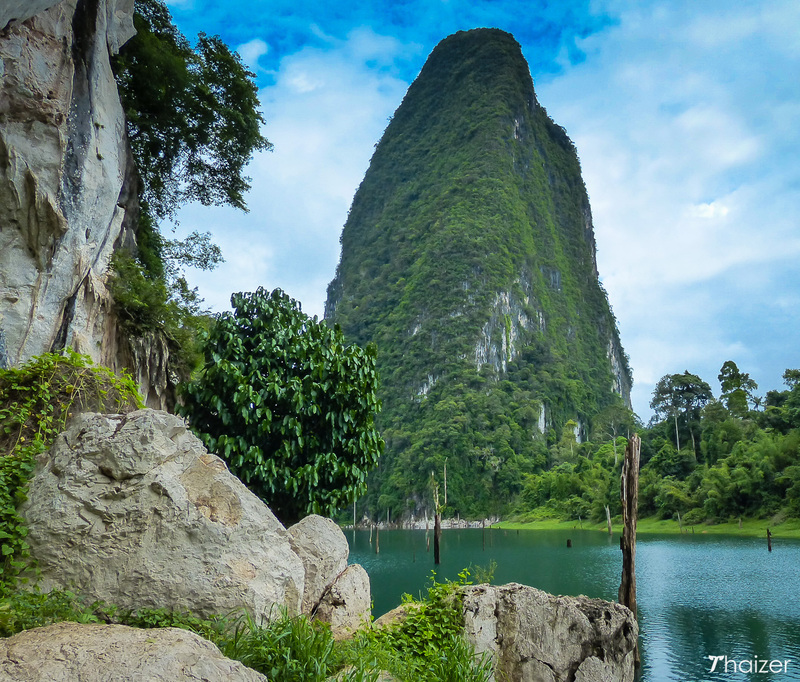 A trip to Cheow Larn Lake is a must-do if you are visiting Khao Sok. It truly is an amazing location with jaw-dropping scenery.